Home » Is Pregnancy Possible with Fibroids? Share the post "Is Pregnancy Possible with Fibroids?" Any fibroid malfunction in a woman is a serious condition; however, a fibroid condition during a potential pregnancy must be taken especially seriously. Here are the facts that you need to know about pregnancy and abnormal fibroid conditions. The short answer to this question is yes. Many women with uterine fibroids become pregnant by totally natural means. The science behind fertility treatment and in the treatment of fibroids allows for a much higher chance of a safe conception. However, a woman who is either trying to become pregnant or is pregnant alongside a fibroid condition must stay under the watchful eye of a team of medical specialists. Are There Any Complications that Fibroids Cause Within a Pregnancy? Although it is perfectly possible for a woman with a fibroid condition to become pregnant, it is more difficult in some cases. Intramural and submucosal fibroids are the two major types of conditions that seem to affect the ability of a woman to conceive. Both of these fibroid conditions change the size and the overall shape of the cavity in the uterus. These conditions may also negatively affect in vitro fertilization, reducing overall fertility rates in some women by as much as 70 percent. The good news is that a fibroid will release its hold over the pregnancy rate of a woman if it is properly treated. Fibroids that are not properly treated may also cause other problems after a pregnancy has been initiated. These problems include preterm delivery of the baby, a need for a cesarean section in order to give birth, a miscarriage, or abnormal fetus positioning. A woman that gives birth with a fibroid condition may also experience very heavy bleeding after giving birth. The main problem with becoming pregnant while having a fibroid condition is the fibroid blocking the natural function of the uterus. The embryo is constantly receiving critically important messages from the uterine wall, and a fibroid condition may block or alter these messages. If they are altered or blocked in a serious enough way, the embryo will simply stop its process of development, and a miscarriage will occur. A medical professional will work under the assumption that even the most silent and asymptomatic fibroid has the ability to cause damage to a growing embryo. Radiology is an essential discipline to include in the process of pregnancy if a fibroid condition has been identified in a pregnant woman. 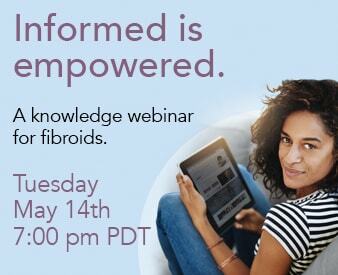 This is especially important for intramural fibroids, a fibroid that develops directly inside of the uterine cavity and competes for space with the embryo, almost like a jealous brother or sister. The result is a chemical interference with the growth of the embryo, and this condition may require a surgery. Do you have uterine fibroids and want to get pregnant? Call (800) 645-6095 today for a FREE consultation.